Among all Indo-Chinese Noodles recipes, Schezwan Noodles is one of the most sought after and widely preferred Noodle Recipes due to its spicy taste and unique garlic flavor. 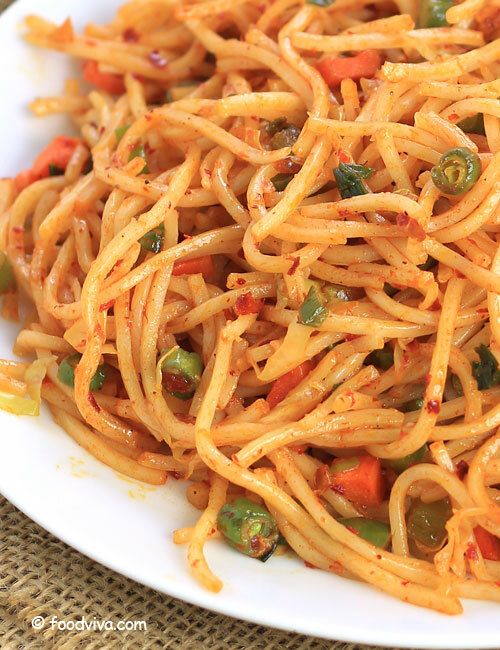 Preparing Schezwan Noodles at Home is very easy and similar to Veg Hakka Noodles Recipe with only difference being this recipe uses a “Spicy Schezwan Sauce” as its main flavoring agent. 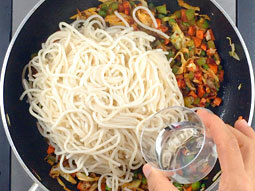 Just toss the boiled noodles with stir-fried veggies and Schezwan Sauce and voila, your noodles are ready. This Schezwan Noodles Recipe explains entire process with step by step photos and also explains how to boil noodles at home as well as prepare Schezwan Sauce from scratch. Cut all the veggies as per instructions given in the ingredients section. Keep other ingredients ready. 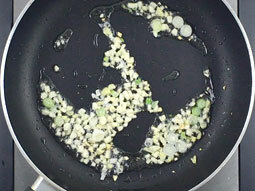 Heat 2 tablespoons oil in a pan or wok over medium flame. 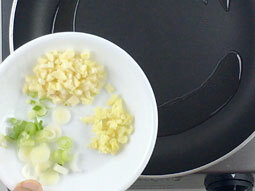 Add finely chopped garlic, ginger and white parts of spring onion. 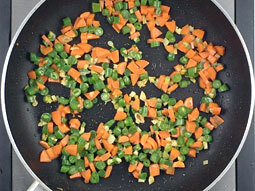 Add carrot and french beans and sauté for a minute. 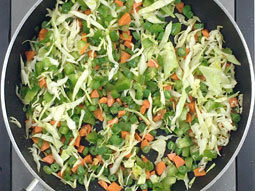 Add finely chopped cabbage and capsicum. Stir and cook over high flame for 3-4 minutes or until the veggies are cooked but little crunchy (not until they turn soft). Add schezwan sauce, black pepper powder and salt. (Schezwan sauce already has salt in it so add only a pinch of salt to compensate for veggies). You can increase or decrease the amount of schezwan sauce per your spice level tolerance. 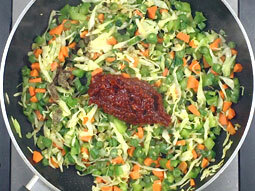 Start by adding 1-tablespoon sauce at a time and then add more as required to get the perfect spiciness you would enjoy. Add boiled noodles and vinegar. Mix well. 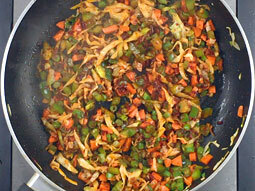 Stir-fry until noodles are evenly coated with the sauce. 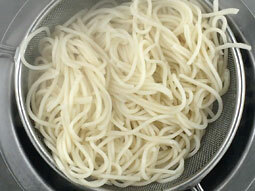 If you are an expert in cooking, toss noodles to mix well or else just stir-fry and mix well. 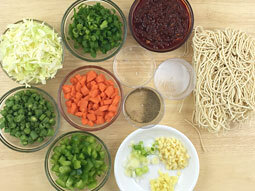 Taste noodles and add more sauce or seasonings if required. Turn off the flame. Schezwan noodles are ready for serving. 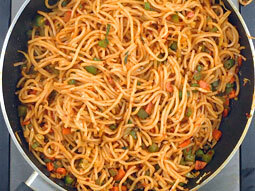 Adjust the amount of schezwan sauce to make noodles as spicy as you like. You can also use the store bought schezwan sauce in this recipe. 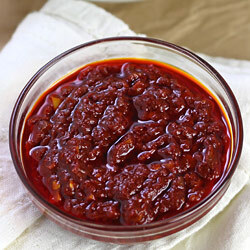 If you are using a store bought sauce, start by adding 1 tablespoon sauce to prevent it from turning very spicy. Taste the noodles and add more as required to make it as spicy you would like. 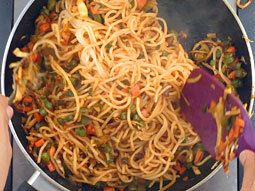 Serving Ideas: Serve schezwan noodles with vegetable Manchurian gravy or chilli paneer.